Windham Weaponry's SRC-308 is a heavy hitting 7.62mm that brings serious power to any engagement! 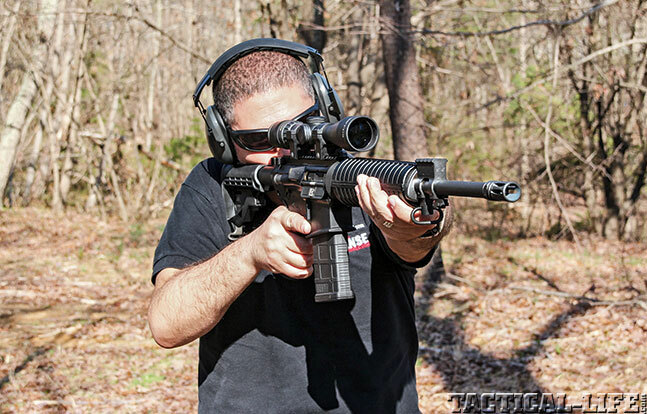 Windham’s SRC-308 is easily capable of trouble-free, sub-MOA performance. Shown with a Nightforce 2.5-10x32mm NXS riflescope. 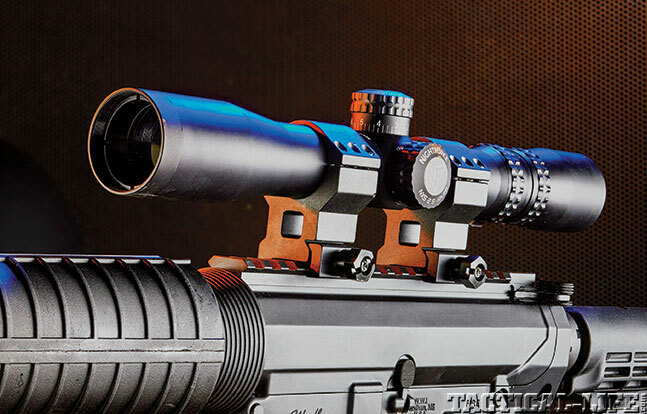 Windham Weaponry’s SRC-308 joins a growing list of heavy-hitting patrol rifles, but it offers a reliable, accurate and optics-ready alternative. One of the SRC-308’s big advantages is that it retains familiar AR controls. As a result, operators won’t have to master a new weapon system to benefit from its 7.62mm chambering. The SRC-308 has several duty-ready enhancements. Note the integral triggerguard and the ambidextrous, quick-detach sling swivel attachment points at the rear of the lower. The SRC-308 ships with polymer, M4-style handguards that protect the support hand from barrel heat. 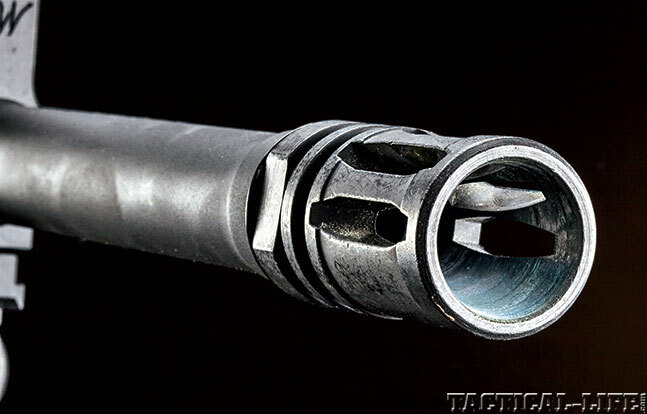 The threaded muzzle of the barrel is topped off with an effective A2-style flash suppressor. While the flattop upper has the angled look of billet manufacturing, it is forged from 7075-T6 aircraft-grade aluminum and given a tough, black hardcoat anodized finish. The polymer buttstock can be adjusted to six different length-of-pull positions to accommodate body armor or shooters of various statures. 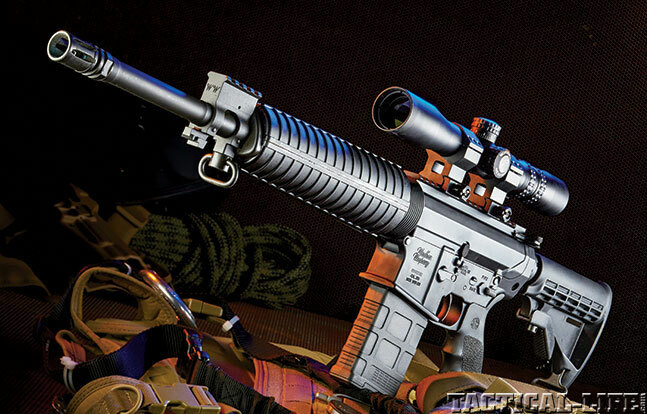 Windham’s SRC-308 is easily capable of trouble-free, sub-MOA performance. 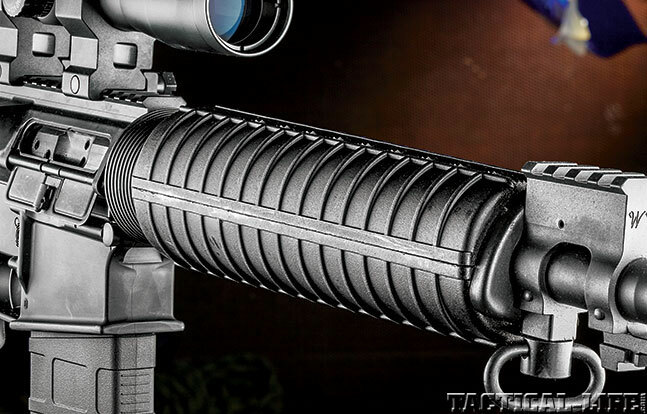 The AR rifle has never been more popular, building on half a century of service with the U.S. military. Now ARs chambered in the much larger 7.62mm NATO round have become popular, and one of the newest entrants in this arena is the Windham Weaponry SRC-308. I find this ironic given how the AR-15 originally came about. Eugene Stoner’s initial design was meant to replace the M1 Garand rifle. 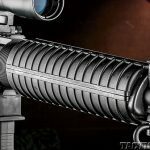 Using composites and aluminum from the aircraft industry, Stoner came up with the ArmaLite AR-10, chambered in 7.62mm NATO with a detachable 20-round magazine. The Army eventually selected a different design that would be renamed the M14, but the ArmaLite AR-10 continued to be improved, and two significant military contracts followed for the Sudanese and Portuguese armies. The ArmaLite AR-10 saw extensive combat use in various insurrections throughout Africa and provided reliable and effective service in rough conditions. A small number were also bought by Cuba and ended up in the hands of Dominican Republic revolutionaries. 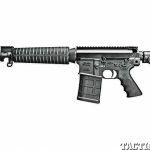 The ArmaLite AR-10 must have left a lasting impression with U.S. military testers, as the Air Force would soon return to seeking a lightweight and small-caliber rifle that eventually became the AR-15 and M16 in 5.56mm NATO. The Windham Weaponry SRC-308 is, at its core, an AR-15 design beefed up to accommodate the 7.62mm NATO/.308 Winchester cartridge. 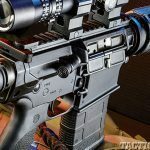 It remains a semi-automatic, direct-impingement rifle with the same manual of arms and controls that are familiar to all AR users, which means the transition and training requirements are minimal. 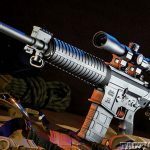 Windham Weaponry itself is quickly becoming a recognizable name in the AR market for its high-quality, mil-spec, reliable and accurate rifles, but this should come as no surprise to those familiar with the company’s history. 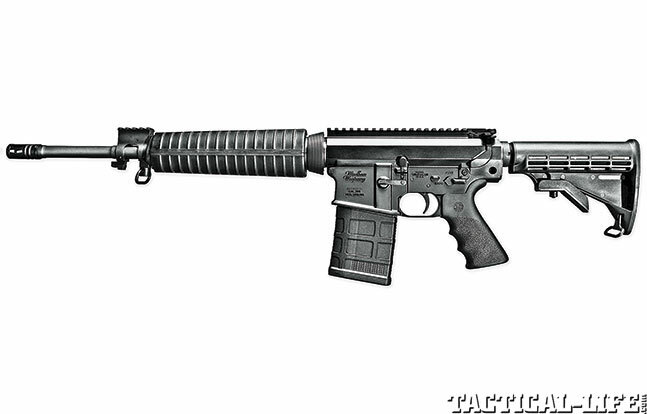 Named after the town of Windham, Maine, the guns are all made in the same factory and by the same machinery and workers who were formerly under the Bushmaster name. Now that same experience and attention to detail are being devoted wholeheartedly to this new, but familiar, endeavor. The SRC-308’s upper and lower receivers are made from forged 7075-T6 aircraft-grade aluminum and given a tough, matte black, hardcoat anodized finish. The upper receiver has a Picatinny rail on top for mounting sights and optics. The carbine comes with no sights, but that’s why it’s named the Sight-Ready Carbine (SRC). 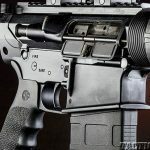 The SRC-308’s standard round handguards don’t have any rails on them, so any optics will be relegated to the 7.25 inches of rail you get on top of the receiver. 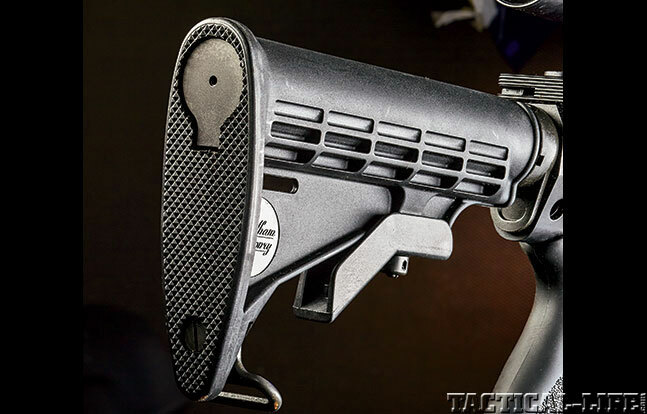 The top of the gas block also features a 2-inch Picatinny rail that has been raised to match the height of the upper receiver’s rail for mounting a front sight. The upper receiver includes a standard steel dust cover, an integral shell deflector and a forward assist. The 16.5-inch barrel has a medium contour. Made from mil-spec 4150M chrome-moly-vanadium 11595E steel, the barrel has a chrome-lined bore and chamber with six-groove, 1-in-10-inch, right-hand-twist rifling. The exterior is Parkerized for corrosion resistance, and the barrel is threaded. An A2-style flash suppressor comes installed. A mid-length gas system is housed under an 8.5-inch-long, round set of handguards that gives the carbine a very traditional look and feel. 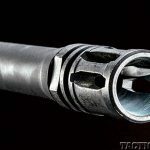 Internally, the bolt is proportionally larger, which will feel massive and very heavy to those used to the standard 5.56mm bolt carrier group. However, the 7.62mm bolt carrier group functions and disassembles in the exact same way for easy and familiar maintenance. Made from Carpenter 158 steel, the bolt carrier also features a properly staked gas key using Grade 8 hardened fasteners for added reliability. The charging handle works well but does not have an extended latch. When using optics, as this rifle is designed to do, it can sometimes be difficult to operate the charging handle, and in my opinion an extended latch is definitely an upgrade to consider in these situations. The lower receiver has an integral triggerguard that has been slightly enlarged to provide better access with gloved hands, but not so much as to interfere with normal operation or appear unusual. The controls are all standard for an AR, with the right-side magazine release deeply recessed inside a full receiver fence to avoid unintentional activation. While the safety selector is non-ambidextrous, it does feature a notch cut on its right side. This, in concert with selector markings cut on both sides of the receiver, allows the user to visually verify the condition of the rifle from either side. The magazine well is slightly flared for faster reloads, and the bolt release is slightly recessed due to the beefier upper receiver, but it’s still very easy to engage or release with a palm slap. Notably, and very conveniently, the rear of the lower receiver features ambidextrous quick-detach (QD) sling swivel attachment points. The lower receiver also comes equipped with a Hogue pistol grip that is both extremely comfortable and very ergonomic. It features soft rubber overmolding that really grips the hand with a nice pebbled texture. The grip has finger grooves on the front, palm swells on the sides, and a beavertail at the top rear helps to lower the grip, placing the index finger more in line with the trigger. The only thing I would like to see added to the Hogue grip is some sort of cover for internal storage space. 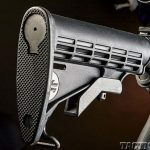 The standard M4-style collapsible stock can be adjusted for six different length-of-pull positions to accommodate shooters of different statures or those using the rifle while wearing heavy winter clothing or body armor. At the toe of the stock there is a standard steel sling attachment point. Finally, the SRC-308 ships with a 20-round Magpul PMAG. On the range, the Windham Weaponry SRC-308 performed in an exemplary fashion with zero malfunctions and zero maintenance. ARs usually like to run with some lubrication on the bolt carrier. In my experience, this is especially the case with 7.62mm-chambered ARs. The SRC-308, however, did not need any extra lubrication over a standard AR. The only thing I noticed is that the spent casings did not get thrown out as far as the gun, without any added lubrication, got dirtier. 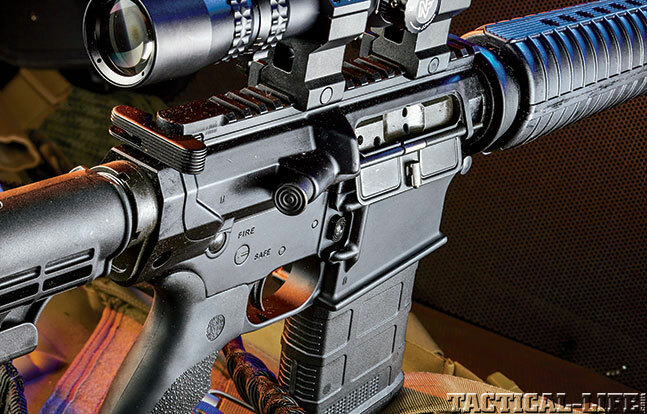 At only 7.55 pounds unloaded, the SRC-308 is very light for an AR in this caliber, and its combination of light weight and short length made it very handy on the range, especially for off-hand shooting. It struck me as an ideal rifle for someone who needed the hard-hitting power of the 7.62mm NATO round but was going to spend most of their time carrying the rifle instead of shooting it. There is a price to be paid for the light weight, and that is in terms of recoil, which was expectedly stout. 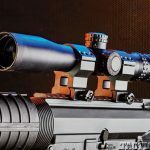 In terms of accuracy, however, the SRC-308 proved outstanding, achieving precision rifle results out of what is essentially a standard duty carbine. 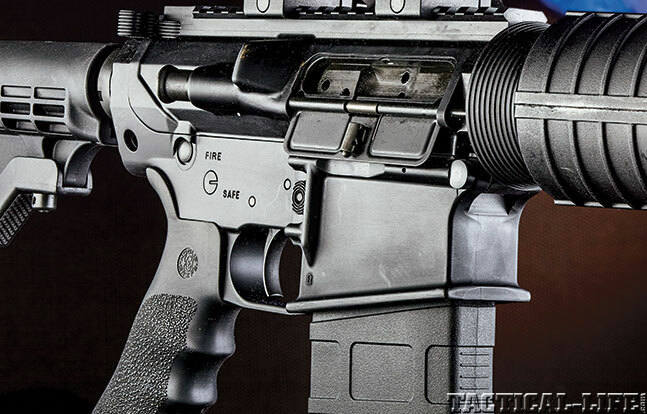 The single-stage trigger, while crisp with minimal creep, weighed in at 6.5 pounds and was purely mil-spec. For accuracy testing, I used the Trijicon 3-9x40mm TR20-2 AccuPoint scope with a mil-dot crosshair reticle featuring an illuminated amber dot. The scope’s excellent fiber optics gather ambient light to illuminate the center amber dot without batteries. This is a very welcome feature, especially for anyone who has hit the range with a red dot or illuminated scope only to find a dead battery. Regardless of the trigger, firing from a stable benchrest at 100 yards, I was able to achieve 1-MOA results. According to Windham Weaponry, this is not unusual, as the test targets the company showed me demonstrated. Windham did recommend using heavy match ammunition for the best results. My best results were right at 1 inch using 168-grain match ammunition from Black Hills and Hornady. Windham said that it was averaging 0.25 to 0.75 MOA using Australian Outback and Federal Gold match ammunition. 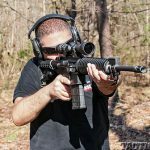 I have had the opportunity to test several Windham Weaponry ARs in the past, and this is the first of the company’s 7.62mm ARs I have tested. 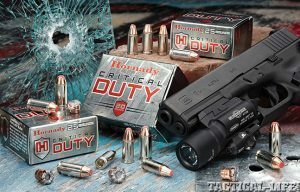 Like the other models from this company, it exhibited impeccable performance, outstanding accuracy and displayed a very high-quality build with a superior fit and finish. This is a company that has no problem standing behind its products, and it offers a fully transferable lifetime warranty. For more information, visit windhamweaponry.com or call 855-808-1888.